It weighs less than 600 grams. Here is my plan for an excellent one person shelter which will keep you safe from just about everything and can be warmed by a cheery fire out the front. 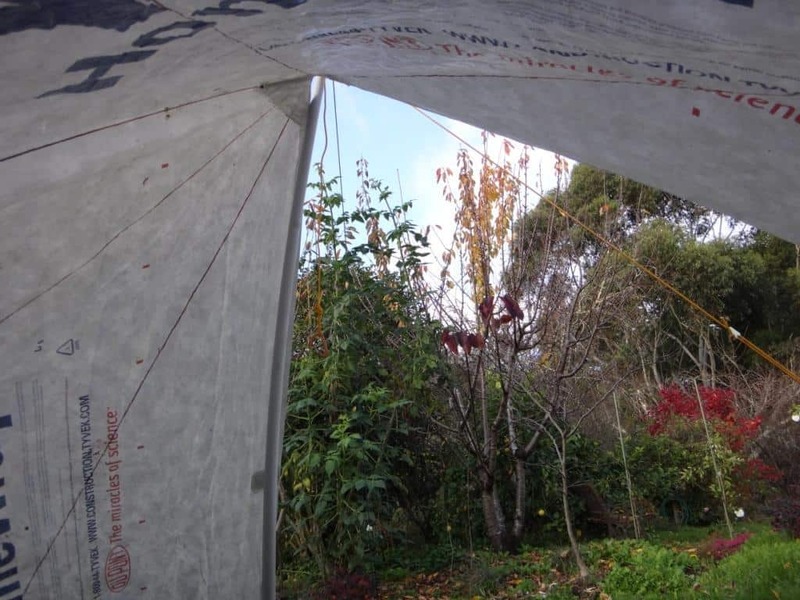 You can cut it in one piece (as shown) from a single sheet of 3 metre wide Tyvek ‘Homewrap’ 3.6 metres long costing about $20. Leave about 2cm more for a hem, which you can tape with Tyvek tape. You can add reinforcing patches to the corners, etc in the same way – or you can learn to sew! If you can’t sew hems & webbing tie outs as shown, you can erect it with tarp clips (eg http://www.shelter-systems.com/gripclips/) You could use these stick on loops (http://www.zpacks.com/large_image.shtml?accessories/tape/stick_on_loop_clear_l.jpg) as bottom tie outs or to erect a bathtub floor, attach your raincoat to close the top half of the opening in bad rain, etc One might be good about 30 cm from the ground to hold out the centre of the windward side in strong winds so the material doesn’t press up against you, and at the windward corners. These Velcro strips might be handy too http://www.zpacks.com/large_image.shtml?materials/velcro_l.jpg & etc. There is clearly plenty of room for one person, lots of gear and a dog or two! I guess two people would fit if you are very good friends, and if you extend the floor forward by about 30cm (join needed – you can use tape). Such a shelter is much better than a tent or bivy bag especially on wet days. You have somewhere warm and comfortable to retreat to, but with a view. 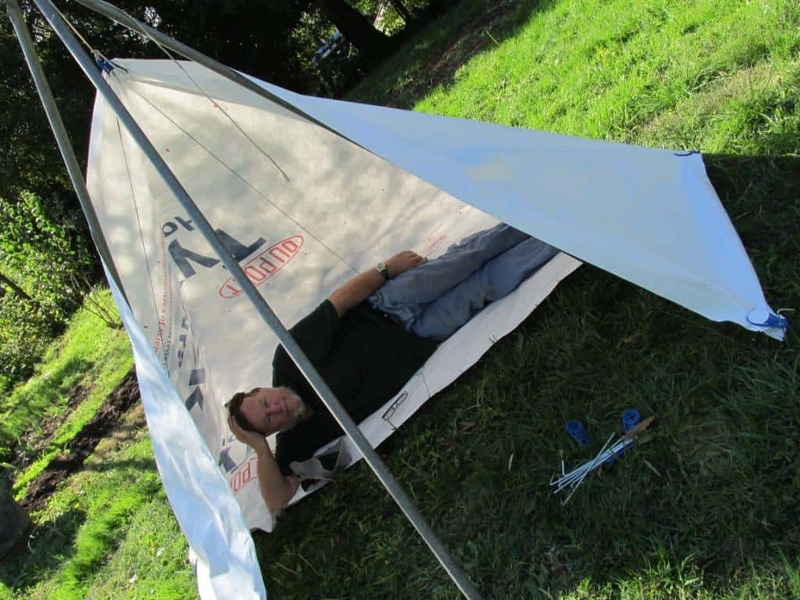 You can cook under cover as Tyvek has a high melting point. It will also withstand 160 Km per hour winds and keeps in the warmth wonderfully. Update 12/11/2015: I have used this shelter many times and found it excellent. I have added a bit more width to the floor (about a foot in the centre) so that when I am sitting on my Cyclone Chair (http://www.theultralighthiker.com/cyclone-chair/) my head is not touching the roof. This would also now make for enough room so two can lie down. 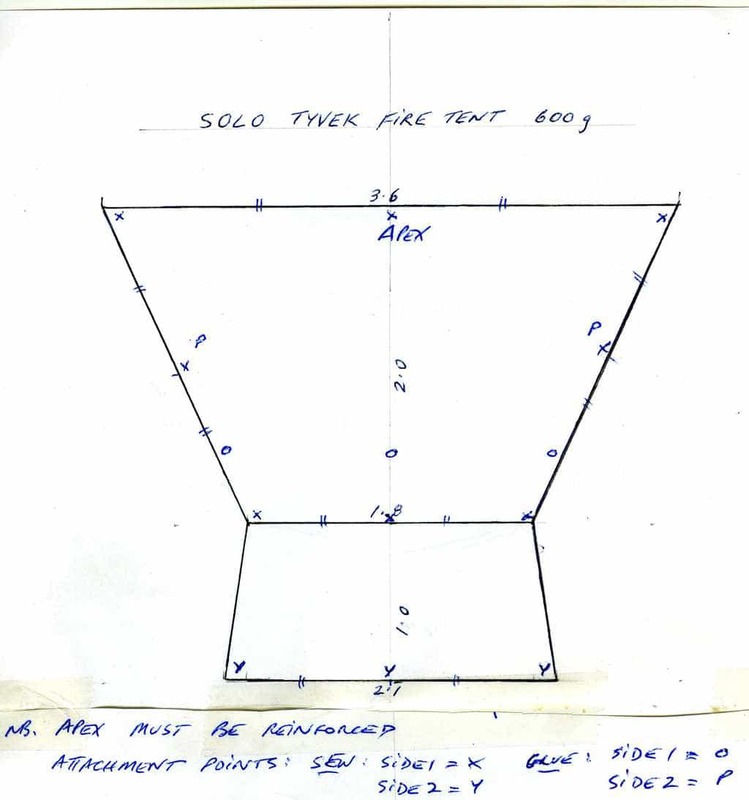 If you wanted a little more room for two I would add two more triangles starting at the centre of the plan below and tapering to be about 2’6″- 3′ at the outside edge. When erected these will give an extra 18″-2′ inside the completely closed shelter. I am also thinking about a ‘hood’ at the top so that when it is completely closed no rain can enter, but air can exit. 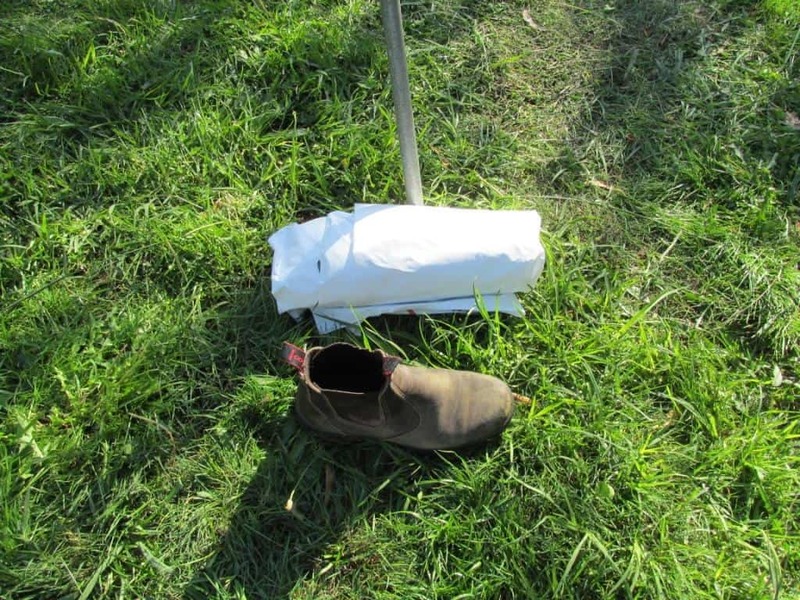 As with many of my plans, I will promise to post them later… The shelter will still only weigh about 800 grams! 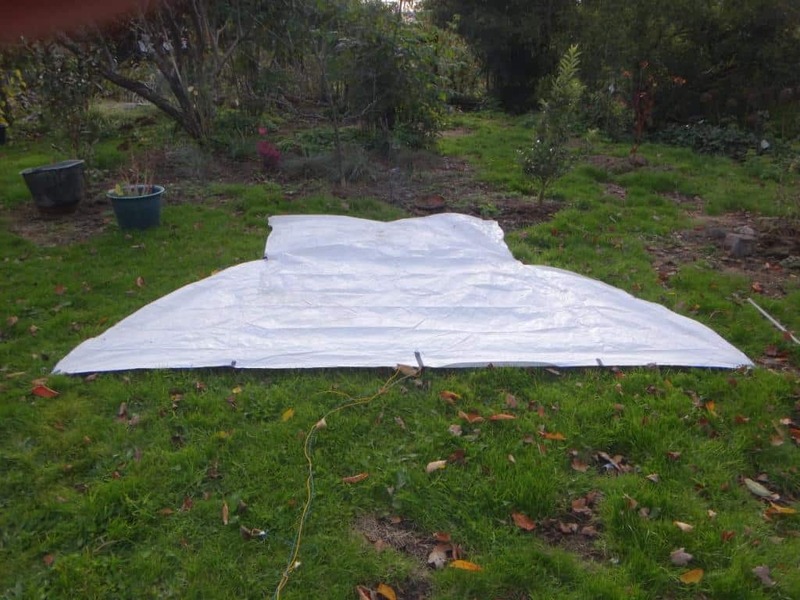 PS: If you can’t access Tyvek ‘Homewrap’ you can make this out of an @ 10′ x 12′ blue poly tarp. 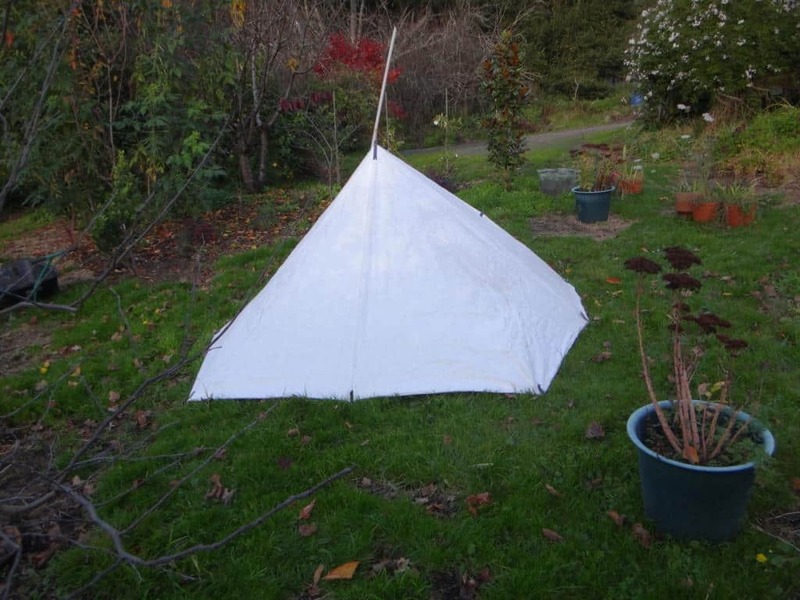 See: http://www.theultralighthiker.com/poly-tent-by-the-ultralight-hiker-on-the-cheap/. 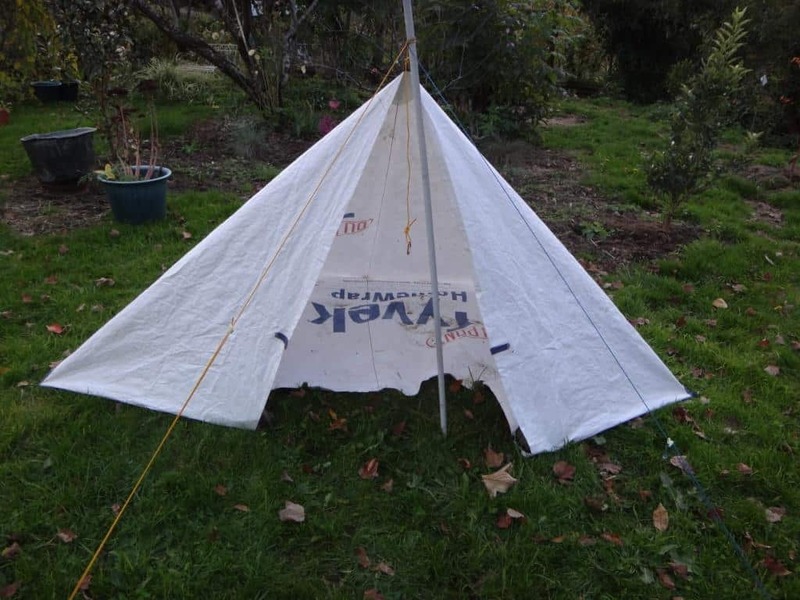 If you can’t sew your own webbing tie-outs, you can use tarp clips (as above) or this: http://www.theultralighthiker.com/worlds-lightest-tarp-clip/ PS: Tape won’t stick to the blue poly. 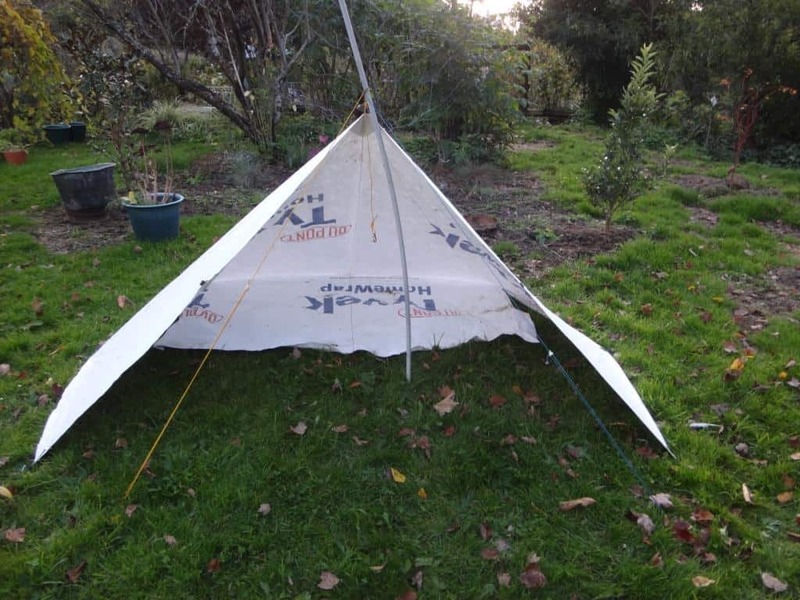 Prototype erected with tarp clips from Aussie Disposals. As usual, make one of these for your own use but if you want to manufacture them, I would like some credit – and some cash, please! Hi, Thanks for putting up your series of “tent/shelter designs”. One is definitely on the cards I just need to work out which one. 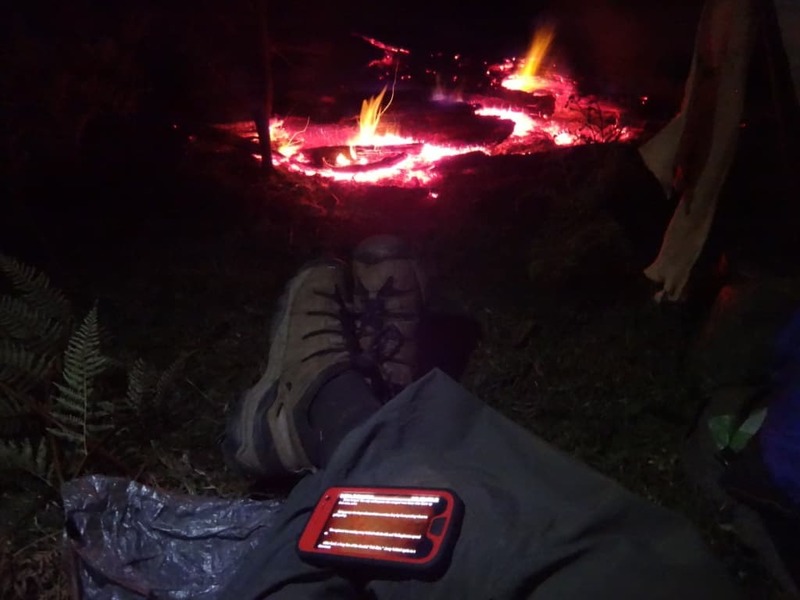 I do like the idea of a campfire to warm. Tyvek sounded pretty good but the bright white was a bit of put off for me so I went searching for ways to dye/print on it. While doing this I cam across a document called the Dupont Tyvek Users Manual. In there it lists the melting point as 135C and auto ignition point as 400C. Hopefully a link to the document is attached in case you want to read it. I’m still going to make one of the tent/shelters. Thanks Steve. Not quites so fire resistant as I thought. I must have confused Celsius and Fahrenheit and the melting point with the ignition point. I find sparks from the fire just roll of it without leaving a mark. I have tried lighting it with a cigarette lighter. It melts away from th flame rather than going up with a whoosh. I’m sure it is more fire resistant than silnylon or canvas though. I always have my fire well out the front – and of course on the lee side. You always have to be careful with fire, but it sure beats being cold and wet which is the alternative after all! Cheers, Steve. Where is the best place to source the Tyvek? Can’t find hardly any local places to buy it (by the metre). I bought rolls from Bensons Hardware in Morwell. You could ring them for a price on a 3 metre roll, then use their price to order it from your local Bunnings at 10% less. You would have to buy a whole roll for $150-180 most likely. This would be enough to make at least half a dozen tents of various configurations including the tipi. I WILL be posting the plans of all (4-5) of them (next week) if I have time. Perhaps a local builder uses it? They should! It is MUCH better than the usual silver paper wrap most use.